The Black Widow Spider is a group of spiders which includes the southern black widow (Latrodectus mactans), the northern black widow (L. variolus), and the western black widow (L. hesperus). As the name indicates, the southern widow is primarily found in (and is indigenous to) the southeastern United States, ranging from Florida to New York, and west to Texas, Oklahoma and Arizona, where they run particularly rampantly. The northern black widow is found primarily in the northeastern United States and southeastern Canada (only on the Bruce Peninsula), though its ranges overlap that of L. mactans quite a bit. The western widow is found in the western United States, as well as in southwestern Canada and much of Mexico. The widow spiders, genus Latrodectus, are among the most recognized spiders on earth; they are the largest of the cobweb weavers, family Theridiidae, and all species are poisonous. The term widow spider originated from the idea that the females devour the males after, or during, mating. This mate devouring behavior is somewhat a myth; while it may occur in captive situations, where the male cannot escape, it is uncommon in the field. There are five species in the United States, one in southern Europe, and additional species in Australia, the Near East, and South America. Widow spiders build strong, sloppy webs, in which the females usually remain, hanging upside down most of the time. Female widow spiders are bulbous and shiny in appearance, and may have bodies 12-16 mm long. Males are much smaller than the females, with longer legs; they are so different in appearance than females, that they are rarely recognized as widow spiders by the lay person; males are not considered a threat to humans, although they do possess venom and can bite. Juvenile widow spiders are usually light colored, and darken to their adult coloration gradually, with each successive molt of their exoskeleton. The term black widow refers to those species in the United States, Europe, and some other areas, which are shiny black in appearance. The most well known of the U.S. black widows is the southern widow, Latrodectus mactans, whose Latin name translates “murderous biting robber”. The southern widow is found in the southeastern U.S., west to central Texas and Oklahoma, and north to southern New York; it is also found in the West Indies. Like most widow spiders, it prefers dark, cool places to build its web, such as outhouses, window wells, under well covers, and beneath trash. The red “hourglass” of the southern widow is actually shaped more like an anvil than a perfect hourglass in most specimens. The southern widow causes many envenomations in humans, particularly in the southern part of its range, where it is most common. The western black widow, Latrodectus Hesperus (photograph), ranges from extreme southwestern Canada, south into Mexico and east to west Texas. Hesperus is the common black widow of the western United States, and is abundant in regions of Arizona, California, and other westerly locales. One of its favored natural habitats is in abandoned rodent holes, but it is often found around human habitations, even in the “downtown” districts of many western U.S. cities. The western widows’ general appearance is very similar to that of the southern widow; the “hourglass” marking in the western widow is usually shaped like a perfect hourglass, though it is divided into two separate “spots” in some specimens. Like its southern cousin, the western widow causes a large number of bites, particularly in the southern part of its range. 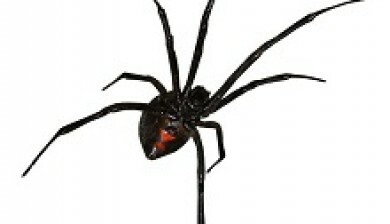 The northern widow, Latrodectus variolus, is the third black widow found in the United States. It is found from extreme southeastern Canada, throughout the New England states, and south to northern Florida. It prefers undisturbed wooded areas, stone walls, stumps, and similar habitats. The “hourglass” of the northern widow is usually divided into two separate, elongate markings. This species is most common in the northern part of its range. While its venom is very similar to that of the southern and western widows, and bites do occur, it does not appear to bite humans as often as those species.